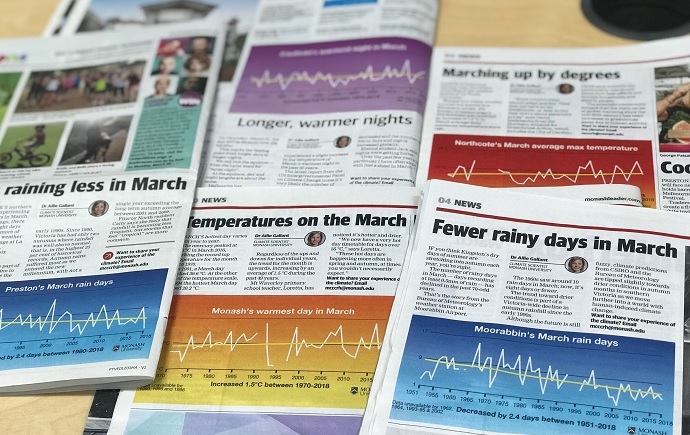 In collaboration with Leader Community News, the MCCCRH delivers weekly localised climate graphics in 23 mastheads across metropolitan Melbourne, along with Australia’s first ever dedicated climate column, Changing Climates. The program sources local climate data from nine weather stations across the city which ensures that each of Leader’s 1.5 million weekly readers receive climate information particular to their local area. In addition to weekly graphs charting observed changes and future climatic projections, Dr. Ailie Gallant, a climate scientist in Monash’s School of Earth, Atmosphere and Environment hosts a weekly column accompanying each graphic. As one of Australia’s only dedicated climate columns, it provides a space for discussing climate change at the local level and is able to draw useful comparisons between different areas of Melbourne. It is hoped that this hyper-localised form of climate communication will assist in improving the climate literacy of Melbournians and help them make effective decisions toward a more sustainable future. Please click here for a sample of how the column will look. This project is proudly supported by the Lord Mayor’s Charitable Foundation. Interested in having your voice heard in Changing Climates? The inclusion of community voices forms a crucial component of this project, and we're looking for a broad range of people to share their experiences with us. From doctors and firefighters, to business owners and sporting coaches, we want to hear from you. If you'd like to be quoted in your local Leader to share how climate change has impacted you, please fill out our Community Climate Survey.